When things happen, they happen fast and furiously, as fast as dominoes. 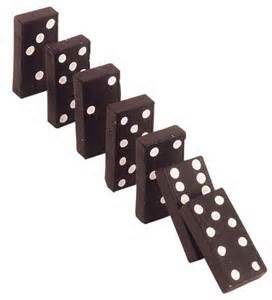 This week has seen political changes happen every day this week, and the first domino was the resignation of John Baird as Foreign Affairs Minister on Monday, Tuesday brought the news that Nipissing MPP and PC Leadership candidate Vic Fedeli was stepping out of the race and now we have heard that Nepean-Carleton MPP Lisa MacLeod has left the race to become the next Ontario PC Leader. The race to replace Tim Hudak is down to three, Federal Conservative MP Patrick Brown and Ontario MPP’s Monte McNaughton and Christine Elliot. The leadership debate in Ottawa next week has just got more intimate. There is much more at stake now. The new riding of Nepean, which John Baird had previously been nominated in, is now seeking a new candidate to carry the Conservative colours. That leaves an opportunity for Lisa MacLeod to become the candidate for the October federal election. She will undoubtedly have to fight off a number of strong candidates to win the nomination. As that might happen, the riding Ms. MacLeod now serves may be looking for a new MPP – the race for the PC Nomination for one of Ontario’s safest PC seats will begin in earnest. More dominoes will fall; who or what will blur the lines of politics between our municipal, provincial and federal is unknown. But through the cold temperatures the political dominoes has made this an interesting week. This entry was posted in Ontario Politics, Ottawa and tagged Conservative Party of Canada, Nepean, Nepean Carleton, Ontario, Ontario PC Party, politics on February 6, 2015 by redheartbluesign.